This is a review of the Pai Sho set available from The Game Crafter, designed and made available by the artist of the modern Pai Sho tiles, Hector Lowe. This is a great set available for a great price! This is higher quality than I expected, being printed by The Game Crafter. The print quality on all the components is especially nice. The tiles are sturdy, laser-cut cardboard pieces. The rules included is a good quality print based on the printable Skud Pai Sho rules. The tiles are small, but the print quality is very nice. The board is sturdy and good quality, but the image is basically a large sticker that’s stuck on the board. My first impression is that it won’t be long before some of the edges start to peel. 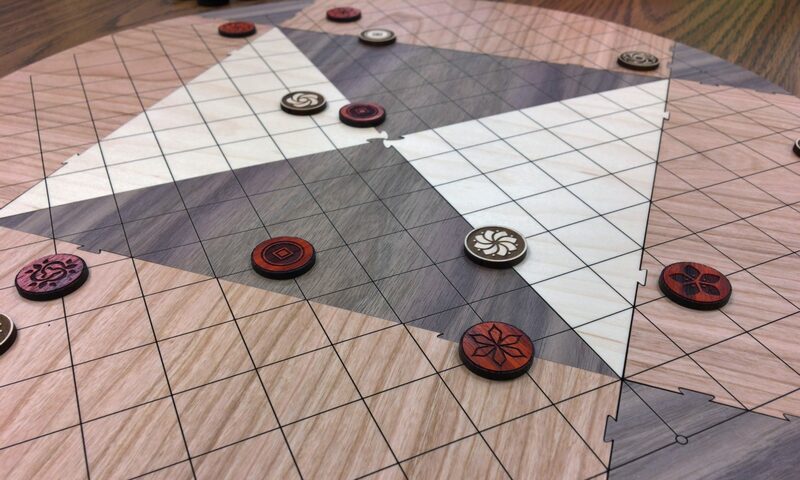 The entire board is 18″x18″, so the actual Pai Sho board playing area is about 17″. The design is very nice, and it’s really nice that there is a Harmony circle in each corner always available to reference. Get yours from The Game Crafter today!